Our little lady is 8 weeks (give or take) from her due date, and my mind is all over the place. I go between being completely ready to have this pregnancy over to being nervous for the newborn stage, mostly the sleep deprivation. Husband and I are regularly talking about how crazy it is to be so quickly approaching a stage of life where we have two children; two girls. It's surreal and exciting. We've reached the point where we are so very curious about who this little girl is, who she looks like, and what her demeanor will be. 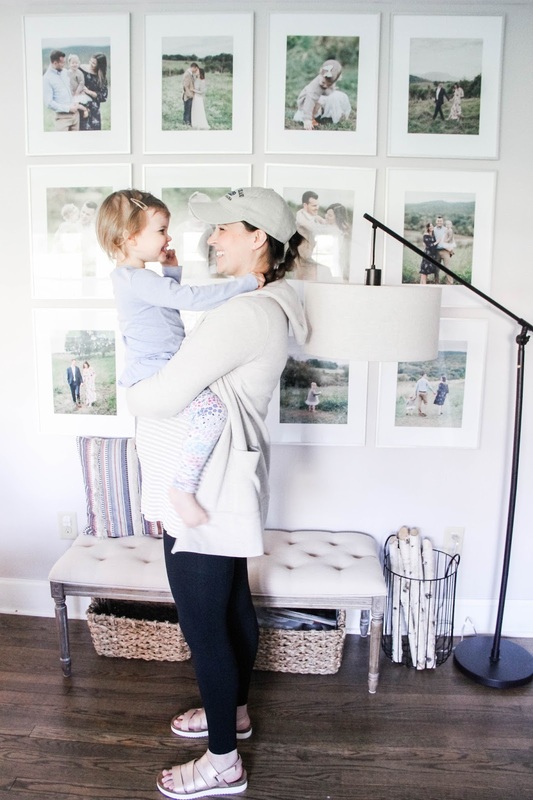 We reached this point a lot earlier on with Greer, and I think it's different this go around because we have a toddler who keeps us going non-stop and the time to sit back and day-dream about baby #2 really doesn't exist. A lot of our conversations about her happen in the kitchen, after we've put Greer to bed, and we're cleaning up the dinner dishes. 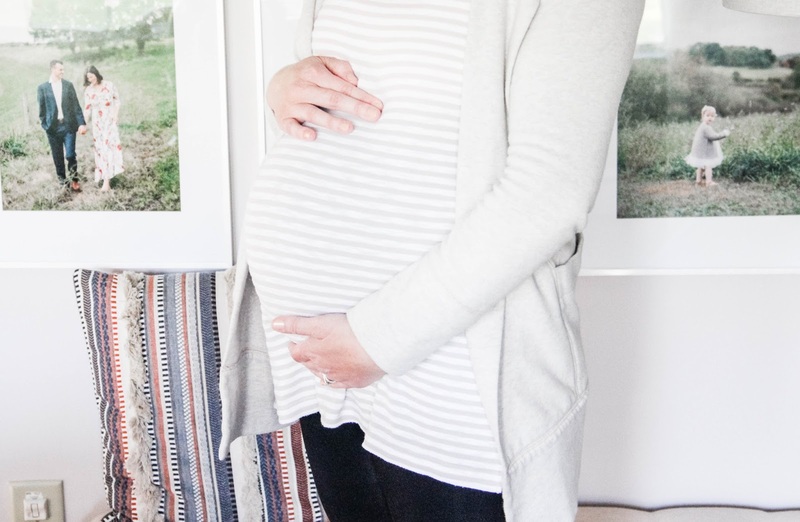 Just last night we were saying how much we are looking forward to introducing our girls to each other, and that makes all the pregnancy woes and fears of newborn life slip away. Let me be honest, this pregnancy has been hard. 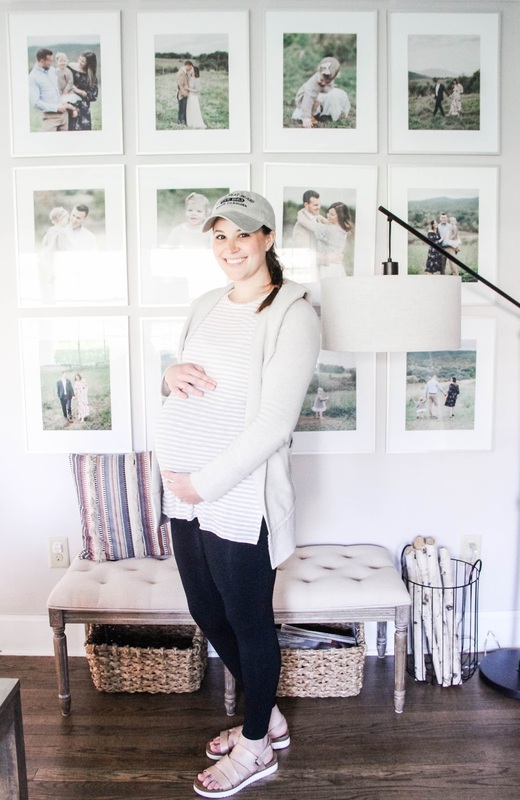 It's completely different than my pregnancy with Greer, and I'm not sure if it's just this baby, the fact that it's a subsequent pregnancy, or because I have a toddler to also keep up with. I think it's each factor + a combination of all the factors. All I know is that when the third trimester arrived, I hit a hard wall where I'm so very ready for this pregnancy to be done. I had an appointment this morning, and at 32 weeks I have gained 26 pounds. Seems like I'm tracking along with the total weight gained during my pregnancy with big sister. At 30 weeks sciatic nerve pain showed up. And unfortunately, it has gradually gotten worse over the last couple of weeks. This is the first time I'm experiencing it, and I am looking for all the ways to make it feel better. The acid reflux is still hanging around, and I'm sure it will until this little lady arrives. I noticed around two weeks ago that swelling in my lower left leg/foot has started. It won't be long until the other leg starts too. Surprisingly, my fingers haven't started swelling yet, and I can still wear my wedding bands. The third trimester fatigue came back in full force, which I think is heightened by chasing a very energetic toddler around. My appetite still isn't quite back, especially at dinner time. I'm shocked that this has hung around this long and find myself wondering if it will come back after pregnancy. Along with that symptom, my tastebuds have started dulling to the point where I can't taste food. It's quite sad, but I'm finding comfort in shaved ice with flavored syrup...which I'm eating every. single. night. thanks to my sweet husband who blends the ice and found flavored syrup for the at-home treat. This little nugget does not stop moving. It's a 24-hour dance party, which is the total opposite of her sister's movements in the womb. It makes me very curious what she'll be like, energy/activity-wise, once she's here. Sleep is hard to come by at this point in pregnancy. I am finding it very difficult to find a comfortable position, especially when I love to sleep on my stomach. The belly is heaving, making it hard to turn, and the bathroom breaks are waking me about twice a night. Overall, I think it's rare that I'm hitting my REM cycle, and that's leaving me tired and unrested by late morning/early afternoon. I'm really looking forward to getting some comfortable sleep, even if I'm being woken up to nurse a tiny baby. Leg cramps, specifically in my left shin and right calf, are really quite terrible. The other morning, I was rolling from my left side to my right when a cramp from my foot to my shin had me waking husband up to help rub it out. Afterward, I downed a banana, some water, then sat with heating pad on my leg to ease the tightness. Winter has hung around for a long time this year, even though the first day of spring was over a month ago. The cold temperatures, snow storms, and dreary days have certainly been wearing on me. When we do get a warm day, I'm so thankful for the warmth and fresh air. The discomfort and various symptoms of this pregnancy have started to wear on me. It's hard to feel upbeat at times, but I know it will all be worth it come due day. Though, June can't get here fast enough. Though we've had her name picked out since before we knew she was a girl, I've been really trying to confirm that it's the name we're going with. This time around we aren't using her name at home because Greer is as sharp as a tack and retains information that you would think she didn't hear. So we've refrained from using Junebug's name so that Greer doesn't spill the beans. Not using her name, like we did when expecting Greer, makes it hard to feel certain that we've selected our favorite. But, I have a feeling we have. It's just going to feel so strange (for the first little bit) to use her actual name when she's here! Nesting kicked in recently, and I'm feeling a little behind on preparations for our girl. 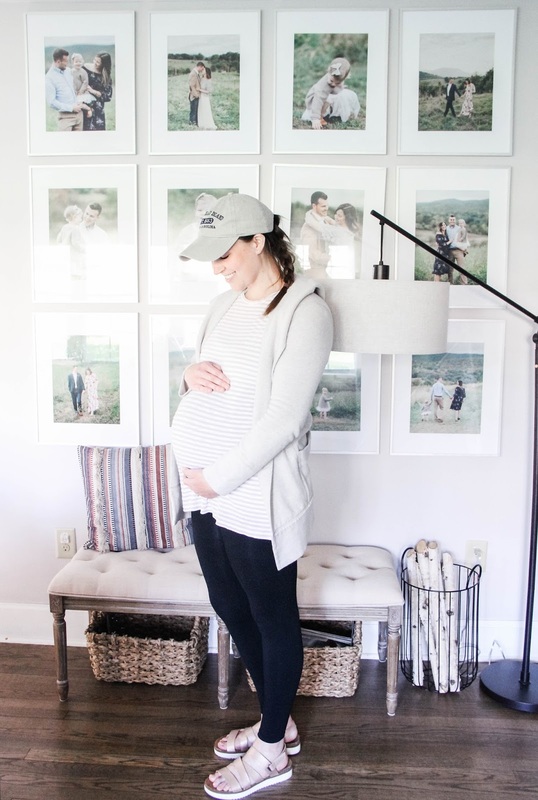 We finally began painting her nursery, starting with the trim, and need to get that in place along with her furniture and décor. I'm still waiting to see if we'll have a VBAC or repeat cesarean with this baby. While I was fairly open to both, I'm finding myself leaning more toward a VBAC for various reasons. All that to say, I'm finding myself more nervous about what position she is in at this point in the game. As of today, the midwife believes she is head-down, but I'm not holding my breath. Instead, I'm trying not to close off toward one option or the other. He's been great at picking up my slack, giving me downtime, and being extra attentive to Greer as I near the end of this pregnancy. Having his support and help changes everything, and it makes me so very thankful for him. I love when he shares how much he's looking forward to meeting our newest girl. While he shares my sentiments about the rocky road that can be newborn life, it doesn't sway his excitement for her arrival. We washed all of Greer's baby clothes + some new clothes we've collected for Junebug a couple of weekends ago, and it was the sweetest to watch Greer go through it all with us, as we sorted out what will work (the girls will be two different seasons in sizes for a little bit until they even out). She loved the thought of sharing her baby clothes with baby sister. In the mornings when she wakes, husband brings Greer into our bedroom and she snuggles up with me for about 20-30 extra minutes. One of her favorite things is to pull of my shirt to find my bare belly then lay her head on it. She'll say hello to Junebug and ask her what she's doing. It makes me so very excited to see her reaction to her sister when she's here. One of my favorite things is listening to Greer talk about how she'll help out with baby. From baths and diaper changes, to giving her bottles and patting her. I love watching this "little mommy" side of her emerge; it's very much like her mama's personality. When we have doctor appointments for baby, Greer gets the biggest kick out of helping measure my belly and holding the doppler to listen for baby's heartbeat. She'll replay the experience for days. Her impression of the way baby's heartbeat sounds, is kind of my favorite. Greer is also certain that her little sister is going to look just like her. I'm, for one, thrilled to find out! We asked Greer what we should name baby sister....her solid response, "Hickory Nut!" She still stands by it too.